My great-grandmother Permelia Nelson Pearce (1839-1914) had one of the most popular British surnames, Nelson, and one of the most unusual first names in all the world, Permelia. Her mother’s name was recorded as Pamelia on her tombstone, but she was called “Millie,” according to family. Our Nelson’s background had been very illusive, but recently new information has been uncovered. Unfortunately, no one from the popular old Pearce-Nelson reunions (1926 – ) could be found to go beyond the names and dates of the 1915 Pearce-Austen Family genalogy list, but I’ll tell you what I know. 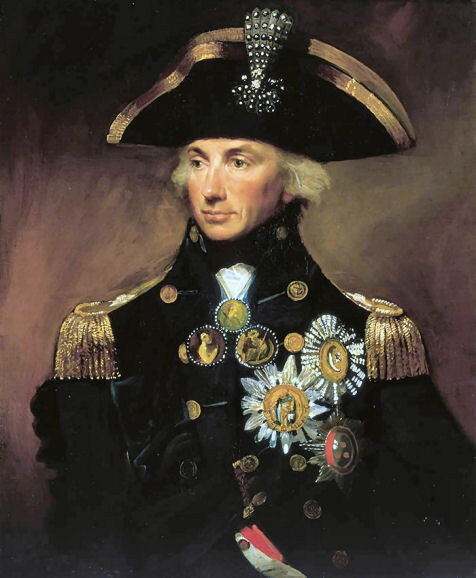 We’ll begin with the origins of the Nelson surname and tell you about some of their namesakes, including history’s most famous, England’s Lord Admiral Horatio Nelson (1758-1805). Then, we’ll tell you about her roles as wife of my Great-grandfather Charles Pearce and mother of 10 children. Nelson or Neilson probably originated in Scandinavia and means “son of Nel or Neil.” This is similar, as we said in our early articles, to the name Pearce, meaning “son of Piers, Pears, or Peter,” which is “Petros” in Greek for “the rock.” However, Nels means “Champion” (New Dictionary). In another similarity, remember that one possible origin of the Pearce name was the Percy Forest, a part of Northern France that had been conquered by Manfred the Dane in 922 AD. Those Scandinavians, along with some Pearces, supposedly accompanied William to England in the invasion of England in1066. Earlier, purely Viking conquests had brought the names and culture of the Norsemen directly to Britain, including Ireland. Perhaps our Nelsons were part of one of those conquests, although it’s more likely that, if our Patriarch John and his son Thomas came from Ireland, those Nelsons were part of a resettling of equal numbers of British and Scottish to “civilize” native peoples in Northern Ireland sometime during the reign of King James in the 17th century. These colonies, including Jamestown in American, were called plantations. The name Nelson can be found around the world as cities, towns, rivers and parks. For example, there is a gold mining town about 400 miles east of Vancouver, Canada, named in 1888 for Hugh Nelson, the lieutenant governor of British Columbia. The Nelson River in northern Manitoba begins near Lake Winnipeg, flows northward, and empties into Hudson Bay. 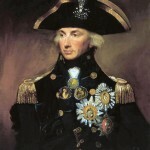 This name Nelson was the sailing master for English explorer Sir Thomas Button in 1612. The name is also used after Lord Nelson in New Zealand for both a port city and park on South Island. · William Rockhill Nelson, journalist, editor, and first publisher of the Kansas City Evening Star (1880) [which later employed Ernest Hemingway]. He was a pioneer in investigative reporting. The Museum of Fine Arts in Kansas City, the 10th largest in the U.S., is named after him. · Baby Face Nelson, 20th century gunman and bank robber known for his vicious murders and youthful looks. · Byron Nelson (b. 1912), professional golfer from Texas whose career was cut short for reasons of health. A PGA tournament is named after him. · Ozzie and Harriet Nelson, TV’s most famous couple of the 1950s and 60s, embodied middle-American values. · Rick Nelson, son of the above, became one of rock music’s first teen idols. He died at the height of his career in the crash of a small airplane on his way to a concert. · Willie Nelson, Texas songwriter and guitarist and one of the most popular country music artists of the late 20the century. His annual July 4th picnic/concert, originally called “FarmAid,” has raised millions for farm-related causes. According to the U.S. Census Bureau, in 1977 Nelson was the 26th most common surname in the United States with over 400,000 family members. Compare that to the many spelling of Pearce, 156th with only 130,000, and Austen, 217th with 103,000. Nelson is one of those names that works as either a first or a last name. I still remember the famous singer of the early 20th century, Nelson Eddy, and his duet with Jeannette McDonald, “Indian Love Call.” My late Uncle Dale Pearce’s middle name was the family name Nelson [see “Sons of Wesley & Bessie: Dale Nelson Pearce”]. Thanks to research by distant cousin Betsy Hare Kemp and cemetery records, we know that our earliest Nelson to come to the United States was John (1778-1859). He was born in Ireland and is buried with his wife Annie Allen (1785-1855) in the Hilands Presbyterian churchyard, Ross Township, where many other famous Pittsburghers lie, the McKnights and Isalys, to mention a few. John and Annie produced nine children, the oldest of whom was Thomas (1803-1876), who may also have been born in Ireland. He married Pamelia Allison (1806-1883), another well-known name in Western Pennsylvania. Allison Park was an early suburb of Pittsburgh’s North Hills. Thomas and Pamelia’s daughter, my great-grandmother, however she was christened, came to be known, Permelia. Perhaps this was the true spelling of Pamelia, which for at least a generation the British post-vocalic “R” was not pronounced. That union produced eight children, and Permelia, the fifth, was born 1n 1839, just five years after her husband Charles, who was the youngest son of 10 to my immigrant great-great grandparents, Richard and Susan Austen Pearce. After being married on April 21, 1859, the Permelia and Charles settled in the large family home next to the Pearce farm and grist mill. He was almost 25 years old by then while she was only 20. He had been working with his father at the mill, but his father was in his mid-70s and more than ready to retire. Their first child, Albert, was born almost exactly 11 months later. The second, baptised Permelia, by this time it seems a family tradition, came two years after that. My grandfather Wesley was their seventh child, born in 1876 when the couple had been married for over 26 years. Charles was in his early 40s then, but believe it or not, the couple eventually had three more children, the last being born 10 years after my grandfather. Great-grandmother Permelia was 47 when baby Clarence was born. We don’t know exactly when the Nelsons arrived to farm the rich soil of the Depreciation Lands north of the frontier city of Pittsburgh, but history tells us that life constantly changing by the early 19th century, with new settlers arriving on a regular basis, including the Nelsons, Pearces, and Austens. People and livestock had to eat and the abundant grain these European transplants grew meant more and more business for the Pearce Mill. Charles and Permelia had to feed a family of 12 [see “Pearce Milling Company: The Story of the Family Business”]. As soon as the children were old enough to help, they were called to work: the girls with their mother in the kitchen or changing diapers and the boys with their father at the mill or around the farm. My Grandfather Wesley married Grandmother Bessie Reed Hill in 1910 as most of the older children had left or were leaving home. They stayed in the big house until Allegheny County took everything in 1927 by the right of eminent domain [see “Settlement at Pine Creek: Parts II & III]. But Great-grandparents Charles and Permelia, in their mid to late 70s then, moved in with daughter Minnie A. Grubbs and her husband “L.L.” just down the road in Wildwood, McCandless Township. Great-grandfather Charles had run the mill successfully for over a half-century, but he was also on the local school board and the trustees’ committee at Salem Methodist Church, of which he and Permelia were founding members [see “Faith of our Fathers (and Mothers): Part II”). Their deaths came only four days apart the first week in May 1914. My late father, Ralph, told me that his grandfather had died of pneumonia and that Permelia, insisting on attending the graveside committal in rainy weather, also caught pneumonia and died. Apparently, they had both been ill prior to this, but the newspaper account simply says, “A pathetic feature of the case was that [Permelia] survived her husband only four days.” My dad never knew his grandparents but fortunately, we have several pictures of Permelia and Charles. While Great-grandfather Charles appears to have been tall, slender, and muscular with white hair and a long beard, Permelia looks slight with long, dark hair parted down the middle and drawn into a bun. She had small features and dark eyes. She is rather serious, avoiding any kind of a smile. Her dark dress is buttoned to the neck with simple white lace at her chin. They are both buried with Charles’ parents and several of their children and grandchildren at Cross Roads Cemetery along Rt. 910, the Wexford-Gibsonia Road. As this round of dust from my research on the Nelson family settles, I look forward to learning more about these hard working, courageous American pioneers. I hope some eternal day to meet the early Nelsons. They can probably tell me stories about the British-American conflict of 1812, the American Civil and Spanish-American Wars, the westward expansion, the coming of the automobile and airplane, and many other inventions. I’m glad they decided to come to America, but most of all, I’m glad they birthed my ancestors. “Climbing Your Family Tree.” Salt Lake City: Church of Jesus Christ of Latter-day Saints, 1977. “Horatio, Lord.” Realm September/October 1995: 28. Kemp, Betsy Hare. E-mail. 22 November 2008. “Nelson.” New Dictionary of American Family Names. 1973.